Often front covers of books use stock images, but the photograph on the cover of Toni Jordan’s Nine Days is integral to the story. 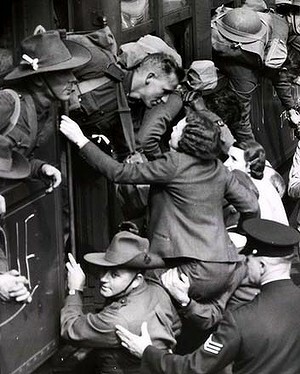 It shows a young woman being hoisted onto the shoulders of soldiers and well-wishers who are gathered around a troop train. The photograph was the impetus for Jordan to write this book, and its significance becomes clear by the end of the story. However, the book is about much more than this photograph. The Westaway family live in Rowena Street Richmond during the late 1930s. Connie is the eldest, Kip and Francis are 15-year-old twins. Their father has died, money is tight but Jean Westaway, their mother, prides herself that the family has improved itself by living ‘up the hill’, away from the slums . Nearby lives Jack, recently returned from the country, who has returned to live with his parents whose house adjoins their business overlooking the Westaway’s backyard. It is 1939 and men are enlisting- Jack among them- and it’s no real surprise that in Toni Jordan’s hands, the photograph on the cover is of Jack and Connie’s farewell. Although this is the central motif, the narrative and chronology of the book skips back and forth. There are nine first-person narrators, all connected to the Westaway family, but separated by time, generation and social class. Jordan makes you work hard as a reader. Each chapter has the narrator’s name, but no information about date or location, and you need to make the connections yourself. Too complex? I don’t think so. Even though I almost resented being shunted from one narrator to the next and being dragged back and forth through the decades, each chapter did its work in bringing the plot forward. In her acknowledgments Jordan thanks historians Janet McCalman from Struggletown and Kate Darian Smith for On the Homefront. Jordan, as a fiction-writer, makes just the sort of use of secondary historical sources that a historian would want. She doesn’t ‘Trove-ize’ Richmond by slathering on detail, but she gives it a lived-in feel, because her research has attuned her to the broad sweep of a community and sensitized her to the meaning of place and not just its appearance. By presenting narratives across multiple decades, she traces the gentrification of both real-estate and aspiration. This book is a departure from Jordan’s earlier work, Addition and The Fall Girl, both of which are light, humourous reads. Even though Nine Days is a sad book which moved me to tears, there are flashes of humour here too. Overall, it’s a much more complex book than her earlier work. You have to work harder as a reader, and Jordan has worked harder as a writer too, to good effect. Posted to the Australian Women Writers Challenge 2015. This entry was posted in Australian Women Writers Challenge 2015, Book reviews, The ladies who say ooooh. Bookmark the permalink. I read this book for my CAE bookgroup some months ago (the review has been sitting in my drafts folder!) The funny thing is that when it was distributed as our next read, I thought I’d already read it and REALLY disliked it. In fact, I had disliked what I thought was this book so much that I didn’t review it here because I couldn’t find a single redeeming feature in it and didn’t want to be so negative. Reluctantly opening it up for a second grudging reading, I was delighted to find that it wasn’t the book that I thought it was at all and I really enjoyed it. And what was the book I thought it was? Can’t remember. It had a woman in uniform on the front cover (probably with her back to us), was set in WWII and was written by a more serious Australian writer to prove that she could write a love story. I think I must have expunged the name from my memory intentionally…..
Ooh now you’ve piqued my curiosity! I’m going to scan my book covers at Goodreads to see if there’s one that answers your description. Oh what a story (in your comment) Janine. I’m so glad you enjoyed this book because I did too – reading and reviewing it when it came out. As you say lighter than the first two novels, and one showing off her narrative skills. I’d forgotten it was set in Richmond which is where my daughter is now living. I should try to read it again. In her ability to capture family with warmth and generosity, she reminded me a little of Ruth Park. BTW “Trove-ize”? Is that a new word in historian circles?! Aha RJ. Good one, though it does rather give Trove a bad name (blames the victim as it were! ), when the problem is the user! But I certainly take your point about too much unnecessary detail.